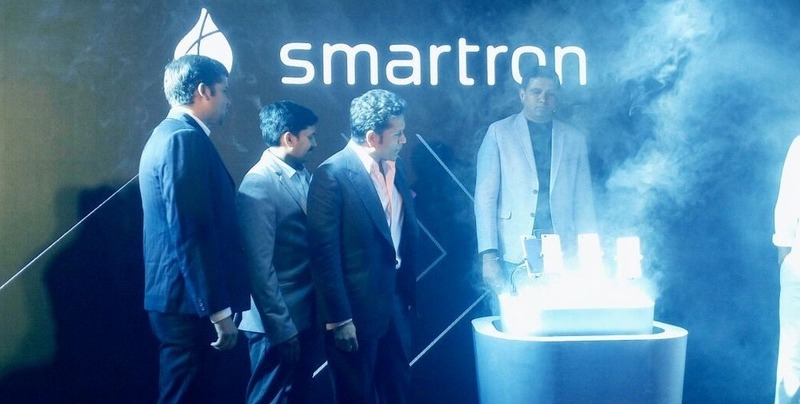 In the presence of Telangana IT Minister KT Rama Rao, Sachin Tendulkar today launched Smartron’s next product: the tphone. Made with a focus of ‘Make In India’, Smartron’ tphone has been designed and engineered in India. Earlier in April, Smartron had also come out with Make in India t.book, a combination of laptop and smartphone. With 4GB RAM and 64 GB external memory, the tphone definitely sports some top of the line specifications. It is also powered with Qualcomm Snapdragon 8994 V2.1 processor, having a rear camera of 13 MP. While speaking on the occasion, Minister Rao said that although Smartron’s biggest coup is roping in Sachin Tendulkar, the phone perfectly encompasses innovation in IoT technology, and elements of Make In India vision. – tphone sports bright orange, metallic pink, sea blue and classic grey shades. These colours signify the rich Indian heritage and culture, encompassing Sun, Sea and the Land. – Indian roads are noisy, and speaking on a phone can be a challenge sometimes. tphone’s superior noise cancellation technology is powered by 4-mic array, which will help a typical Indian to speak comfortably outside. – Indian summer can be hot and sunny. To overcome the display issues under Sun, tphone is powered with 5.5 inch super amoled display with apical assertive technology. – In order to empower Indians with unlimited space to store movies, songs and data, tphone will provide unlimited storage via tcloud. Although, external in-built memory is 64 GB. As per Smartron’ CEO Mahesh Lingareddy, his company will soon manufacture 100% of their products in India. In our view, the t-phone pricetag of Rs 22,999 is slightly on the higher side. But considering the deep research done in embedding Make In India Features and the development of their own tranx platform, which supports IoT functionalities with Android, it’s surely a big leap for Indian technology and imagination. We will try to bring you hands-on review of t-phone soon! "Sachin Tendulkar Just Launched Smartron tphone; 5 Features That Justify Its Make In India Tag", 4 out of 5 based on 10 ratings. Reading through, am impressed by the charging speed. IS that True ? When is this expected to hit market. Seems pretty kool in design, features and technical outputs.